God's Clothes Closet began with a vision, with 1 bag of shoes and 2 bags of women's clothing. The thought was to provide for a need in the community that would be beneficial to the lives of the people in Brooksville. Having just gone past our first year of operating the Clothes Closet, we now have three overstuffed rooms of men's, women's, boys, girls and infants clothing. God is blessing this community though the patrons and contributors to God's Clothes Closet. Our motto for the Clothes Closet is very direct, "For those who would forgo other life essentials to have clothing." Having good clothing and a limited amount of toiletry items, we are blessed by God to provide this needed Clothes Closet on Wednesday mornings from 9:30am until 1:00 pm. 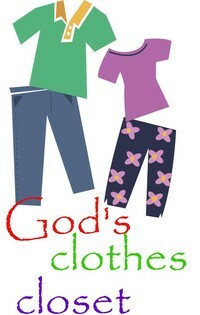 Those wishing to drop off clothing for God's Clothes Closet may do so Tuesday-Friday, 9:00 am until noon. For special times of drop off please call 352-796-8331.